Home » Clogging Blog » Clog Dancing near Salem, Oregon… Really? Have you ever tried clog dancing? Try it once, and you’re hooked! Today’s clog dancing is an energetic step dance. Some even say it’s a form of aerobic exercise. The roots of the dance are at least 700 years deep, and they’re no less interesting than the dance itself. Yes, there are clogging groups and clog dancing studios all over America now – even near Salem, Oregon, right here in Silverton! English, Scottish, Irish, and Dutch-German immigrants settled the Appalachian Mountains in the mid-1700s. The dances of each area collided and combined to create a unique foot-tapping dance style, which is the beginning of clogging we know today. It didn’t take long for the “new” clogging dance to become popular. By the mid-1800s you could find cloggers in the mountains and flatlands, in urban and rural areas, and in both black and white communities. Cherokee Indians, Russian Gypsies, and the African Blacks all accepted clog dancing. Clogging became a true ‘melting pot’ of various cultures and dances. Clogging was at first an individual dance. It wasn’t until the 1920s that team clogging became popular. The town of Asheville, North Carolina, saw the first clog dancing team performance in 1927 when The Smokey Mountain Dancers appeared at the Bascom Lamar Lunsford Festival. The next decade brought team clogging its own competition at the festival, and the winners, Soco Gap Dancers, got a chance to perform at the White House. It was in 1939 during a presidential audience with the Queen of England. The performance, described by Queen Elizabeth as “just like clogging in our country,” brought clogging widespread recognition and respect. Clog dancing continued to develop into more of a show form, and the following decades brought the development of precision clogging and the line dance. 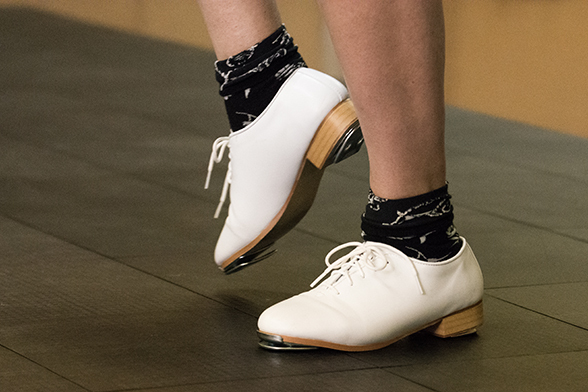 The beauty of clog dancing is that its form is constantly changing yet remains rooted. The dance that began as a simple rhythmic dance evolved into a more complex form that requires preparation and cannot be improvised. The steps are inspired by country dancing, jazz tap, breakdancing, and even street hip-hop elements. Clog dancing attracts young and both alike and there are numerous conventions and competitions across the country. What are the different names of clog dancing? Technology makes it a lot easier to learn your first clogging steps these days. Check this series of lessons for beginners online and start practicing today: Get started with clogging. Our ancestors started this dance as a simple rhythmic movement and it continues to evolve into a more complex routine. Who knows, you might be the one who will launch the next big clog dancing trend. So get started now and Let’s clog!! !